This is where to play online slots in style with Monster Madness. The opening with a cutscene set in a grey futuristic landscape full of a lightning strike, we are introduced to each of the monster characters as they run towards the screen being chased by a flying robot. It’s a surprise to see a cutscene introducing a Tom Horn game, let alone a CGI one full of rich detail. With that in mind, let’s dive into the game to learn more about the monster wins on offer. Tom Horn Gaming label themselves an omnichannel software supplier with a rich portfolio of casino games, including several popular online slots. If you enjoyed the developer behind Monster Madness, then you can learn to play slot games about some of their other titles here. 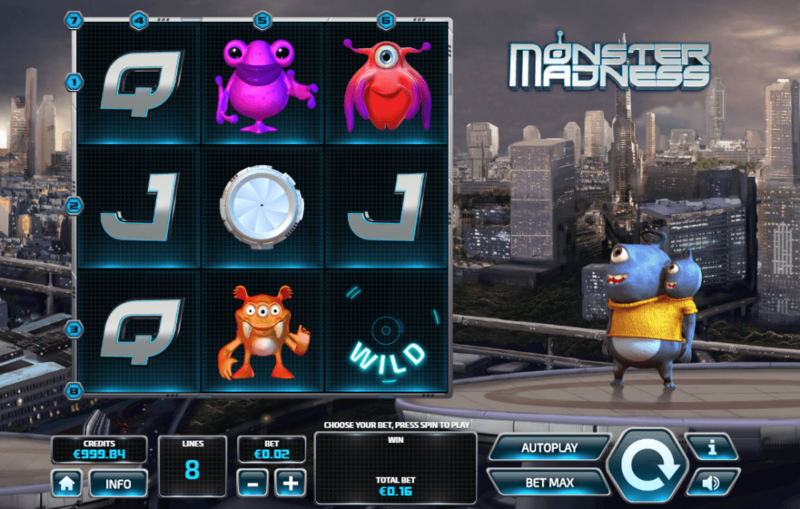 Strangely when compared to most slots online, Monster Madness is a square Gameboard with 3 rows and only 3 reels. It is strange to see such a small board, particularly as there is so much space on the right-hand side. It is little replacement for more reels to have one of the monsters standing on a floaty platform, if even the little guy does look brilliant, like something out of a Pixar film. Learn more about some more best video slot games like this through our guide. The icons in the game continue the long legacy in online slots of using iconography from a standard deck of playing cards. Here the number 10 and letters J, Q, K and A comprise the low value icons, each adding a mini multiplier to the scoreline. The high value icons are the monsters themselves. All 4 look great from the spiky blue cyclops and the pink, stick-fingered toad character to the red tentacle monster and the sabre-toothed, 3-eyed, wing-eared orange creature. Respectively, hitting 3 of a kind of these monsters earns multiples of 1.5x, 3x, 6x and 12x. There is also a WILD which resembles a radar offering 30x for 3 of a kind and substituting all the regular symbols except the SCATTER. SCATTERS resemble a futuristic door or tunnel opening and offer between 5 and 1 free spins for landing 3 to 9 of them on the Gameboard. 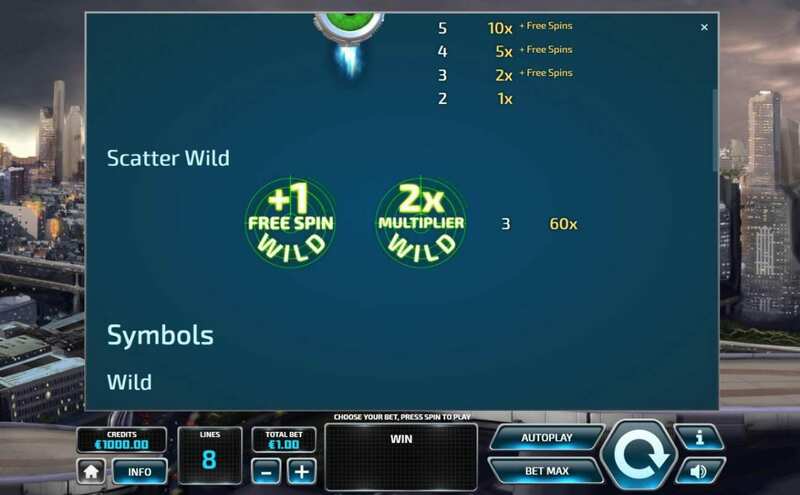 There are also SCATTER WILDS which offer an extra free spin or a 2x multiplier. Sadly, the SCATTER is not present during free spin rounds so further spins can not be triggered. SCATTER WILDS are also only present during free spin rounds. The online slot features only 8 wining paylines meaning multiple winning combinations can be tricky to hit. However, bets are modifiable between 0.20 and 100 so you can tweak your stake to risk greater rewards. Tom Horn games have largely been very stripped back and simplistic so it was quite a surprise to see a cutscene at the beginning full of great looking CGI monsters and a richly detailed sci-fi background. However, once into the main game itself, you quickly notice that the gameplay not only basic but stripped back further than usual as the regular 5 reels have been downgraded to 3. With no bonus features to speak of beyond some free spins, Monster Madness is a pedestrian online slot with little to recommend beyond some visual flair. If you enjoyed playing Monster Madness then why not play Rainbow Riches today.